The DevJam lounge, known as the 46th Street Entry (after the 7th Street Entry at 1st Ave), got a new fridge this week. Unlike most boring fridges, it is a replica of a Marshall stack amplifier popularized by Jimi Hendrix, used by the likes of Van Halen and a myriad of other rockers throughout the years. This Marshall fridge is just one of many unconventionalities that help DevJam(mers) find new perspectives, and what we affectionately call a “DevJamism.” After being asked to do so by our friends, we offer up a interesting DevJamisms for your reading pleasure. Riffing on the idea of a retrospective, we organized our first regret-tro-spective a few years ago because we wanted to shed a few haunting challenges. A few people were holding close to frustrations and we wanted to help them let go. We did this as a group, and the experience was the powerful part. 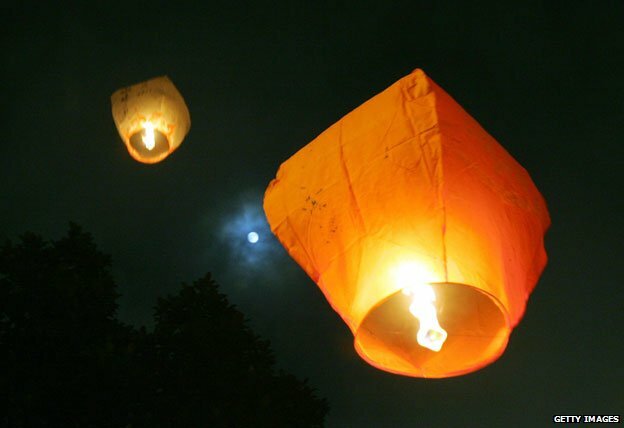 We all laughed and smiled as the lanterns lit up and then floated off. Along the way, we grew a bond in an experience that was both interesting and supportive. We value language and the metaphors we live by. We have tried to eliminate the boring label “meetings” by renaming them as “jam sessions.” This led us to another favorite DevJamism: a Mardi Gras. The Mardi Gras stems from our want to have better conversations and better health. We realized that walking and talking helps us get a new perspective, so we started doing more walking meetings. Not wanting to fall back into the anti-pattern of “meetingitis,” we starting pondering what a mobile jam session would be called. At first we thought of a marching band, but the groove was simply not sufficient. Then it hit us, some of the best mobile music is in New Orleans in the form of a jazz band who strolls the streets, kick out sloppy grooves that are meant to draw people closer. This was the birth of a Mardi Gras. Whether it’s Marshall Refrigerators or Mardi Gras or Jam Sessions, if you hang out with the DevJammers, you will hear a pile of DevJamisms. These alternative frames on life do not come from a meeting where we sit around and think these up, that would be tragically ironic. Instead, they come out of jam sessions and free space to dream of differences that allows us to incrementally evolve and improve our discussions and actions. For us, it’s a bit about being better, which often also means being different. If you feel so moved, send us some of your creative, collaborative innovations and we will post them. Maybe we can start a mini-movement of new ideas and words that can breathe life into areas where there is little oxygen (e.g. meeting land).